Using window film materials to maximum practical benefit gives this newly converted en-suite bathroom the required level of privacy. Part wall / part glass construction allows light to enter from the windows outside the room during the day. 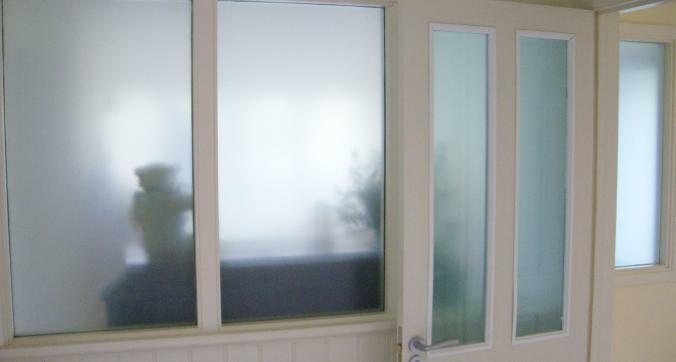 Two different coloured frosted films provide the privacy. The photo shows the view from inside looking out. How can window film help at home? Window film is fitted for practical and aesthetic reasons. Frosted and reflective window films offer privacy and security, particularly for windows with a public facing aspect or where they are overlooked. Costs are based on the type of film, the number of windows and more specifically the surface area of the glass to be covered. If you provide us with rough measurements we can provide you with an approximate cost. Depending on the complexity of the installation, it may be necessary to inspect the working area for potential issues before we start. Tinting Express will take the time to explain the options and test the glass for suitability.